It's hard to believe that another year has passed. When you have young ones at home, as I do, it sometimes feels as though the time just flies by. It reminds me of the sentiment of a Rush song, Time Stand Still. This year has been an interesting one for me, at least in terms of what has happened trackside and on this blog. I've been pressed for time far too often this year but I've still managed to come away from this year with some great experiences trackside. I just hope you enjoyed them as much as I enjoyed sharing them with you. Railways will always be special to me in intangible ways that I cannot properly describe on this blog. Whether it be the first time my grandfather took me inside a CP engine in Windsor as a kid or the countless hours I spent riding between Ottawa and Sarnia to see my family for the holidays. Railways will always be connected in my mind to home and family. My mother once told me that there was a reason I continued to refer to my hometown of Corunna, Ontario as "home" even though I haven't lived there in decades. It's because home is a state of mind. You associate a town with your sense of place in the world and your tribe, so to speak. To me, railways carry a similar sentimental connection. Aside from my fascination with the physics, optics and business side of the industry, I love railways because it's part of who I am. It's part of the identity of my family. It's home. So please accept my sincere gratitude for dropping by, commenting and, as always, steering me onto the right track when I've gone astray. Many people have contributed tips, photos, thoughts and encouragement to me over the course of the year. I greatly appreciate every single railfan that has helped me with this blog in some way. Merry Christmas and a Happy New Year to everyone throughout the Ottawa Valley, Eastern Ontario, Southwestern Ontario, throughout Canada and wherever else you may be. It's been an interesting year of watching the rails for me, even if I haven't been out nearly as much as I have in past years. However, I think I made up for my lack of time spent trackside with the quality of some of my trackside experiences. Here are a few of my favourite highlights from 2017. 1. Double enders - I began to see Via Rail Canada's double ender corridor trains a few times, which fellow railfans say is the wave of the future for the national passenger rail operator. With P42s on either end of these corridor trains, there is no need to wye engines and turn them around. It's a quick turnaround for a train when one journey is done and the return trip is imminent. This is a shot I took of a double ended train crossing Cedarview Road in March of this year. And another from the Twin Elm Road crossing from March. 2. Wraps! - Of course, the Via project to wrap many of its engines and LRC coaches in Canada 150 wraps was a welcome site for those of us who don't get to watch much railway action other than Via Rail. I spent a good portion earlier this year hanging out at the local Via stations and along its local trackage searching for these specially marked units and coaches. This is one of my favourite shots, taken of P42 920 pulling in to Fallowfield Station. I caught this unit a few times. And here are a few more wraps shots, including this one of one of the many wrapped coaches. And here is another shot of a double ender with a wrapped engine and coach from April. The Via corridor trains have really taken on a rainbow appearance of late, with the wrapped coaches, the coaches in the original paint scheme and the coaches in the renaissance green scheme. Here's a good wrap shot taken along the 401 in Kingston in May. So for the first half of the year, much of my trackside experiences were pretty much like this, since I didn't have the opportunity to catch anything else. Speaking of Via, I did manage to duck out in early January and capture some shots of the CP Smiths Falls yard. And, although it was exceedingly quiet, I did manage to capture a Toronto-bound Via Rail train rounding the curve into the yard. I also managed to drop by the Central Station on Tremblay Road to catch some shots. The Belfast Road overpass is once again accessible to railfans, with the O-Train Confederation Line construction finished near the overpass. I used this access to catch this shot of Via Renaissance equipment being pulled east by a F40PH-2. Then there was a lucky break when I was in the neighbourhood near the station in January and caught these two generations of Via power side by side from the TrainYards retail plaza side of the station. Those are my Via highlights from the year. I will be sure to try and get out there soon and catch some more Via action. I still haven't caught any of the F40 wraps. I guess that's as good a place as any to start for the coming year. My brother sent me some really cool photos from Florida this week that make me rethink what I was going to post. In other words, I liked his shots so much that I thought I would share those shots. It wasn't until I was looking through my "random shots" file on my computer that I realized that I had a treasure trove of photos to share that I haven't gotten around to organizing. Sadly, some of these shots have been waiting to see the light of day since 2015! Well, time to clear out the closet. First shot and it's a special shot. 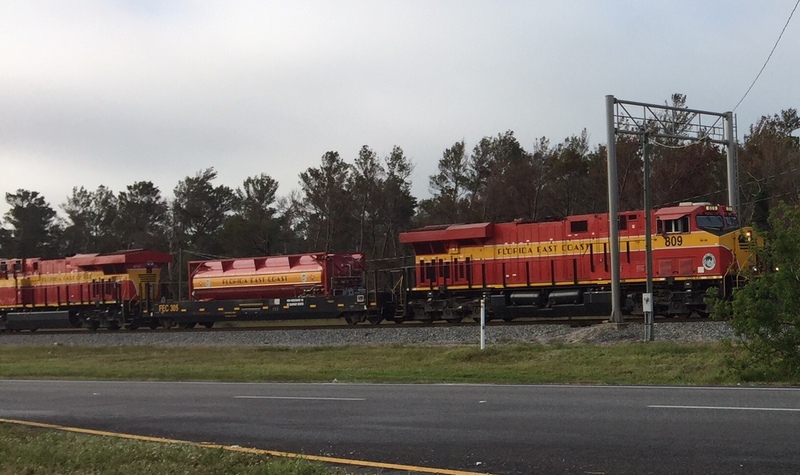 My brother snagged two Florida East Coast ES44AC locomotives, with a liquified natural gas tender in between, pulling a mixed freight. What's more, the engines are also sporting the railway's retro sunshine theme paint scheme. Florida East Coast is a railway worth shooting, in my opinion. I have seen this railway in action but have never captured it with my camera. The railway just announced recently that it has converted all its mainline locomotives to LNG, which should prove to be an interesting experiment. Of course, the parent company of this railway is hardly what one would call a conservative company. FEC's parent company is behind the Brightline high-speed rail service on Florida's east coat. The next shot I thought I had lost until I unearthed it while putting together this post. This is a BNSF freight train somewhere in Denver, Colo. The shot was taken in August 2016 by my brother's wife. I'm lucky that they have a railfan in the family, which is why they are always looking out for railway photos wherever they go. My nephew and I get to share the spoils. Sadly, I don't have any further details on this shot. Here's another shot from my brother that has been sitting in the queue for two years. This was a shot he took during a snowstorm in November 2015 of a CN freight train barreling west toward the St. Clair Tunnel. This is a shot I captured this summer in London of a Via Rail corridor consist inching its way along the end of the Goderich Exeter Railway's Guelph Subdivision in London. I didn't see much of anyone on the train, so I assumed it was deadheading, but then I saw someone in the window. Can you see the passenger? That train was left to idle on the track for a while, since I could hear it from the parking lot where I was participating in the preparations for a family event. Someone with better knowledge of London might be able to inform me of the route Via trains take through the city. I included this shot just to show that the first class coach was second in line, which I found odd. Can anyone explain why this might happen? One final shot of a Via corridor train loading up at Fallowfield Station this past May. I tried to get some shots that conveyed just how close the parking lot is to the tracks. It makes for some tough shooting for railfans! This train was due west for Toronto and had a wrapped P42 on point. So, there you go. A few random shots for your enjoyment. I'm glad my brother's adventures in Florida made me think about some of the lost shots that have yet to see the light on this blog.